1930's vintage 2 bedroom cabin minutes from town. Fully equipped kitchen with vintage red Rachael Ray stove. Welcome to Coyote Moon! 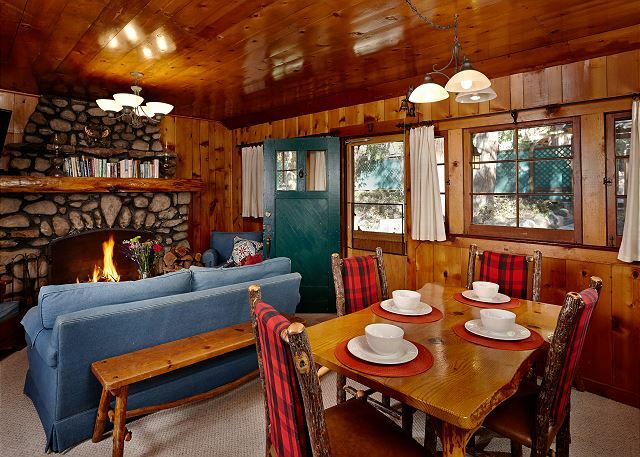 This vintage mountain home is perfect for those who crave the novelty of a classic cabin in the woods. This home is perfect for couples and small groups of 6 or less. When you walk into the home, you will be warmly welcomed by the home’s mountain décor. Although the home was built in the 1930s, the home has been maintained so it maintains it’s vintage charm without feeling “old”. The home’s kitchen has a beautiful red vintage Rachel Ray stove as well as all the essentials one could need in a kitchen. The dining table seats up to 6 people. The living room has a beautiful stone fireplace that is perfect for snuggling up near during the winter months. The home has two bedrooms, both bedrooms have queen sized beds, and 1.5 bathrooms. An air mattress can be provided to accommodate up to 6 guests. Outside the home there is a BBQ and outdoor lounge seating where you can enjoy the surrounding nature and listen to the creek lull you into relaxation. The home is only a 10 minute walk away from town, where you can explore the local shops and restaurants. The home also is nearby the popular Strawberry Creek. Coyote Moon is a classic textbook cabin in the woods and is perfect for a weekend away from it all. The home has a vintage charm to it that guests love so much they can’t help but want to return! 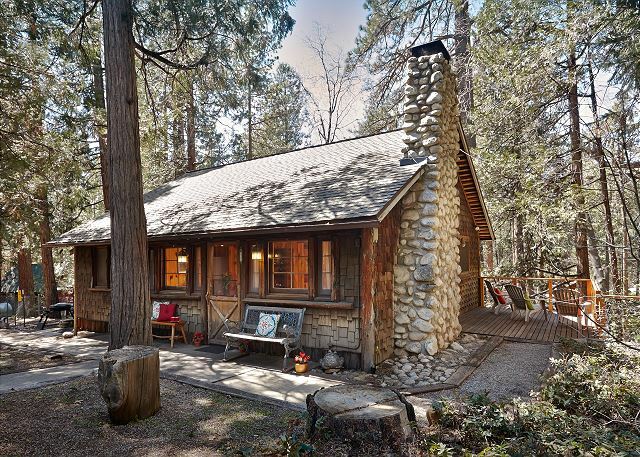 Book today and escape to the beautiful mountains of Idyllwild! Weekend rate Friday/Saturday is $200.00 p/night. Weekday rate Sunday thru Thursday is $175.00 p/night. Winter Holiday rate $300.00 p/night (Thanksgiving, Christmas, New Year's Eve), with a 4 night minimum. Holiday rate $225.00 p/night, a 3 day minimum may be required. Call us for our weekly/monthly specials. Pets are welcome. Pet fee will apply. Linen/Prep fee $95.00. The cabin is darling. It’s rustic and cozy. The smell of the fireplace was overpowering for the first day of our two-day stay. I imagine that it has been a while since someone cleared the char out of the chimney. The furniture is dated but in theme. The beds, however, were cozy! The charm of this place out weighed the minor disappointments. The kitchen is well stocked with anything one would need for making basic meals. The heating worked well! Enjoy the privacy and quiet. Cute, peaceful cabin perfect for a quiet getaway. Easy walk to town (15-20 mins) or few minutes drive to Humber Park Trailhead. Highly recommend. One night get away - way too short ! My family and I (2 adults and a 2 year old) stayed at the cabin for a weekend. The pictures absolutely lived up to the reality. We loved this cabin. It was quaint, quiet and cozy as can be. The beds were comfortable and the heat worked well. It is was not walking distance to town for us, but that's because our 2 year old does not sit in a stroller and not enough sidewalk room for her to walk safely. The drive into town was literally under 2 minutes though. The check in and check out process was the easiest I have ever done. We enjoyed this cabin immensely and hope to return in the future. Monica was so helpful and kind on the phone. She confirmed our reservation and even offered an early check-in. Too bad the cabin wasn’t ready when we arrived. We were looking for an old rustic cabin for a quiet weekend and that is exactly what we got. My only suggestion is that maybe the owner thinks about updating the LR furniture, buys new mattresses/pillows for the beds, and adds wi-fi. Great location to this sweet little village and the price was great! If you’re looking for 5 Star, this is not it. Nothing fancy here but was exactly what we wanted. 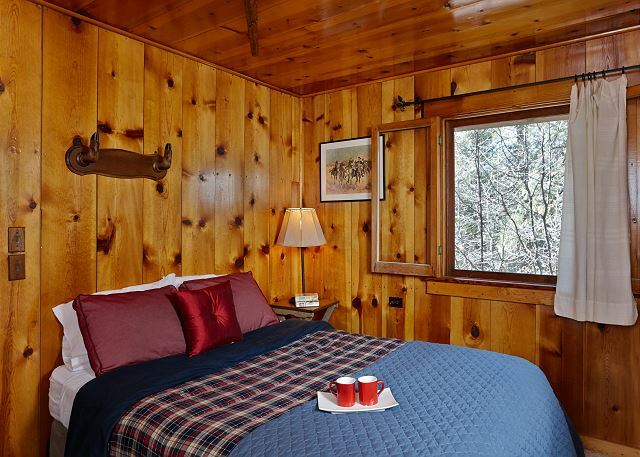 Very cozy cabin, well maintained and charming! Maybe too early in the season, but wish there might have been some outside furniture, (table and chairs) to enjoy nature. There were a few plastic adirondack chairs but they all had cracks in the seat! Also, the photo shows the cabin very lit up. Just be aware that it was a bit darker. Overall I would stay there again! We loved the entire rental experience from start to finish. Communication was perfect with the rental company, the cabin was historic, rustic, and yet very very clean. The check-in and check-out procedure couldnt have been easier. Highly recommend this authentic cabin (dont be lame and expect that youre staying at a hotel, please), with a true mountain feel to it. Fenced yard and a little stream out back. Nicely constructed deck to enjoy too. Dont be nervous about the wood for the fireplace rule. Just dont bring your own wood to burn up into Idyllwild, but you can buy it in town where you like, or just use the wood delivery service that they recommend if youre too lazy to pick up your own wood in town. Great! Management office was super friendly! Outstanding. Rental is Rustic cabin! Smells like a wood burning fire (loved this). This cabin was exactly what I was looking for. My mother, two aunts and myself stayed one night (would have loved to stay longer) at this wonderful home in Idyllwild. It was a lovely place with good amenities and very clean. My family and I, two kids and two adults, had a wonderful stay at Coyote Moon cabin. It was perfect for our dogs as well since it is fenced and gated all around. Very clean and everything worked. Could not have asked for more. Idyllwild was, as usual, perfect. We had a great time for our family vacation. The house was quaint and clean. We loved the yard, too! Perhaps a more thorough list of things to do with children would have been helpful. Had a great time! We are pleased that you enjoyed your stay. We have full list of activities for kids, and we do apologize for the inconvenience of the information not being handed to you at the time of check in or in the 3 ring binder at the home. We have made sure to add the list to the welcome packet you receive when you arrive at your office and 2nd is now in the 3 ring binder at the home. I had a wonderful weekend staying in this cabin. It had everything I needed and has a very woodsy feel. My only suggestion would be to bring your own knives if you plan to cook. The ones in the home were fine for eating, but made food prep a little difficult. The outdoor area is very nice as well. Everything was handled well for the prep of my stay, and the place was quiet, easy to use and fit my needs.